A sofa bed is a great investment for your small home or apartment. You may not have an extra room to accommodate guests, but you can easily create a comfortable sleeping space right in your living room just by pulling a mattress out of the sofa seat area.Sofa beds have gotten a bad rep over the years thanks to the dowdy designs that we’ve all seen collecting dust in the dens and living rooms of our grandmother’s homes. But today’s sofa beds are stylish and offer unique functionality. You can find a sofa bed that looks better than many of the couches you could buy in a new furniture store. This small sofa has a modest design that belies the huge impact it will make on your guest’s sleep. The sofa really isn’t much bigger than a love seat, but it has a pull-out bed that is queen sized, which is plenty of room to accommodate most guests. This is no paper-thin mattress that is barely more than a foam pad. This is a memory foam mattress that contours to the body of the person sleeping on it, providing pressure right where it’s needed and relieving pressure everywhere else. Anyone sleeping on this mattress will have a great night’s sleep. The sofa itself has a simple yet attractive design. 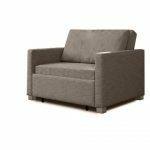 It has clean lines that are perfect for a modern aesthetic, and it is upholstered in soft fabric that is comfortable to the touch. Color options include Taupe PU, sand and stone grey. The tan is only available for leather upholstery. This tufted sofa bed has a luxurious look that would be right at home in even the most sophisticated of decor schemes. The sofa has clean, simple lines that are reminiscent of modern, designer furniture, and the tufting creates interesting accents without being too much. This fashionable sofa bed doesn’t work like pull-out couches. It’s more like a futon — but with much higher-quality construction and a vastly superior design. 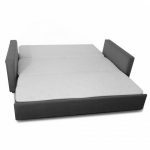 The Tilt Sofa Bed turns into a bed by laying the seat back flat. The tufted cushions on the seat and the back lie side-by-side to create the sleeping area, and the cushions are just as comfortable as most mattresses. You won’t have to struggle to set up the sleeping space with this sofa bed. 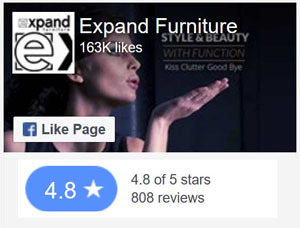 You don’t have to wrangle a mattress out of the seating area, and you don’t have to worry about the hinges getting stuck. You just push back the seat, and the sleeping area is ready. 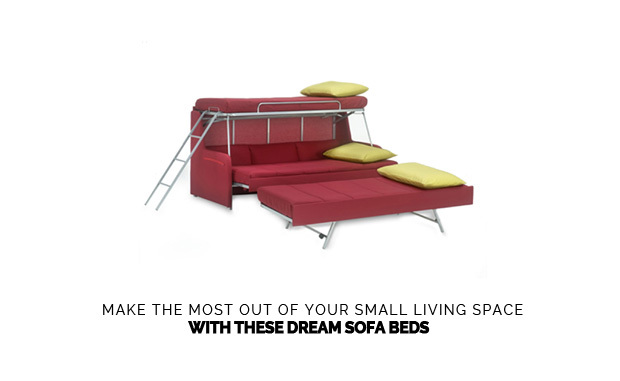 For maximum sleeping area in the smallest amount of square feet, this sofa bunk bed is the solution. The standard-sized sofa houses three twin beds, providing sleeping space for three adults or as many as six children. 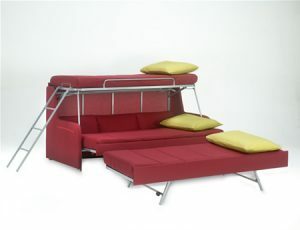 The sofa’s seat back lifts up to become the top bunk, and the two other mattresses pull out of the seating area. One mattress lies where the sofa’s seating area was, and the other features fold-down legs to set up next to the couch like a cot. The design is created for ease of functionality and style. You will be able to quickly and easily transform the sofa into the separate beds, and the sofa is stylish and sophisticated as a seating area. You can put this sofa in your living room or a spare room to accommodate guests when you have them. You can also use it in your children’s bedroom to make more space for play during the day. Sometimes, you need just enough space for one, so even a whole sofa bed can become too much for one room. The Harmony single sofa bed with memory foam mattress is the ideal solution. It is essentially a couch chair that offers a cozy nook for one to curl up with a soft blanket and watch a good movie or to read an engrossing book. When the sofa is transformed, it becomes a single bed that can sleep one adult or two children. 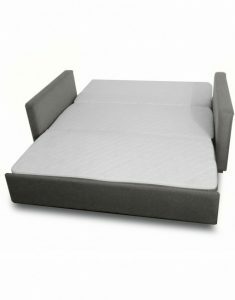 This single sofa bed converts the same way the larger Harmony sofa beds do, so it is easy to manage even for children. The memory foam mattress provides a comfortable and restful night’s sleep for even the pickiest of sleepers. The size of this single sofa bed means that you can easily include it as an accent piece in any room of your home, including a child’s room. You can also group this piece with another single sofa bed or with a larger queen sofa bed or king sofa bed. The grouping will look like a nice seating area, and the bedding contained within will provide more space for guests. You’ll easily be able to accommodate a family who comes to visit. 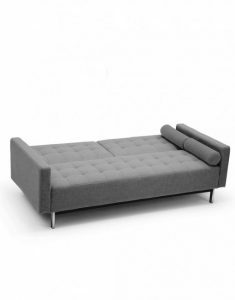 The Harmony single sofa bed in a handsome iron grey fabric that will blend in well with most décor schemes. It can easily be matched with pieces in other colors, as well. It just doesn’t get better than a king size bed for a luxurious night’s sleep. Even when you are sleeping with a partner, you have plenty of room to sprawl out so you never feel cramped or locked into position. The king size bed has saved many a marriage! With the Harmony king sofa bed, you can get the luxury of a king size bed without having to sacrifice the enormous floor space for it. You can open up your room for exercise equipment or a study area, or you can leave the floor space clear to give the room a clean, uncluttered look. Of course, you can also use the king sofa bed in other rooms of your house that could be used for guests, such as your living room or home office. You’ll retain use of those rooms when guests aren’t visiting, but you’ll also have amazing sleeping options ready when visitors are in town. Most guests will be expecting a flimsy fold-out couch or a low-quality bed – they’ll be pleasantly surprised when you open up this king size beauty with a memory foam mattress that will make them feel like they’re sleeping on a cloud. The modern design comes in either iron grey or basket beige fabric, giving you the options you need to match it to your décor. The clean lines and simple yet elegant design make for a gorgeous sofa bed that will elevate the profile of any room. The quality construction means that it will last for many decades, all while giving you or your guests a great night’s sleep. 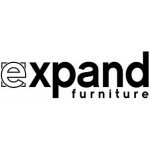 Expand Furniture sells all of these transforming, space-saving sofa beds, as well as numerous other wall beds and expanding furniture. 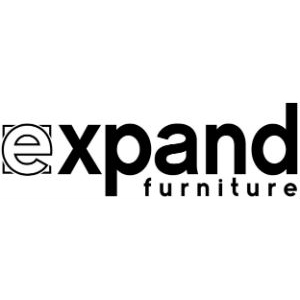 We sell stylish, high-quality furniture for every room of your home, helping you to maximize the space so you get the functionality you want without having to get more square footage. 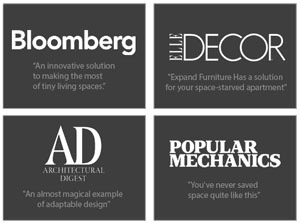 Our furniture is built to last, and it offers many customization options. Explore our catalog to find the right solutions for your home.